Dancehall entertainer Alkaline could be working on a new diss track aimed at his longtime rival Popcaan. The Vendetta deejay was spotted in studio over the weekend following his recent Instagram post directed to the Unruly Boss. Alkaline snapped a photo with his close friend and longtime producer Jahvy Ambassador, “Everything ago mek sense soon🎭 #YoJahvy ⏰🤐 #newtorch🔥 @manhimselff,” Jahvy wrote. On Saturday, Alkaline took to his Instagram story to upload a video highlighting his gritty “Microwave” 2017 diss track aimed at the “Stay Dog” deejay. Popcaan and Alkaline have been beefing for years, their rivalry reached a boiling point in 2017 when Alkaline released a scathing diss track, “Microwave.” Popcaan never responded to that diss record, however he continued to take a few shots the “Badness It Name” deejay in a few other singles and also on social media. 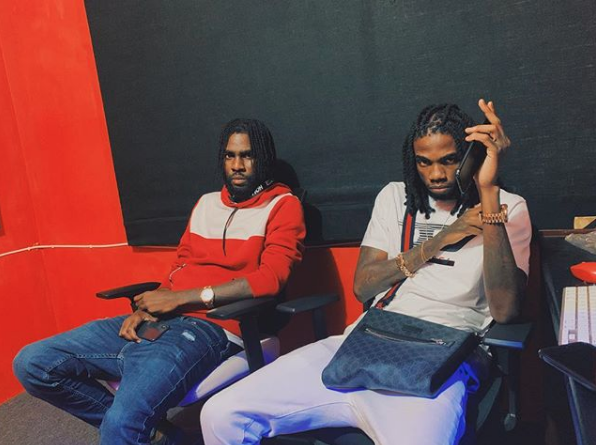 Last November Popcaan blasted an Alkaline supporter after he uploaded a photo on Instagram praising his new protege Quada. Popcaan shared that 2019 would be promising for the “Celebration” deejay however a Vendetta fan wasn’t here for it and left a negative comment. “F**kry ya chat p***y,” an IG user named ‘Team Alkaline’ wrote. Popcaan hammered back with a few insults, “@teamalkaline a you a f**k battywash man? P***y unu done dead off already enuh battyman,” he wrote.